Hundreds of fascinating accounts and unexplainable events fill the pages of the Bible. Awesome Bible Mysteries and Miracles takes a closer look at these events with vivid illustrations and interactive songs. Where is heaven? Did Methuselah really live that long? Did manna really fall from heaven? These are only a few examples of God's amazing power explored in this collection of stories. Small enough to fit in your CD holder but-with twenty songs and twenty stories-large enough to entertain for hours, these mysterious and miraculous stories are accompanied by lively songs performed by the Wonder Kids and produced by Steven Elkins of Wonder Workshop. - Publisher Hundreds of fascinating accounts and unexplainable events fill the pages of the Bible. This storybook-and-CD-package takes a closer look at 20 of these events with vivid illustrations and 20 interactive songs that explore God's amazing power. Full color. About "Awesome Bible Mysteries (#05 in My Travel Time Storybooks Series)"
Hundreds of fascinating accounts and unexplainable events fill the pages of the Bible. This storybook-and-CD-package takes a closer look at 20 of these events with vivid illustrations and 20 interactive songs that explore God's amazing power. Full color. Newcomer Chad Stephens has recently completed his first series of children's books, My Travel Time Storybooks, created by Stephen Elkins. Prior to this, Chad's writings included audio scripts for Wonder Workshop, as well as ten video scripts for The Church Initiative Group. Chad is a Nashville native, where completed his degree at Belmont University. He currently resides with his wife, Anne, and dog, Stella. Small enough for your CD holder, these sets are great for car trips! 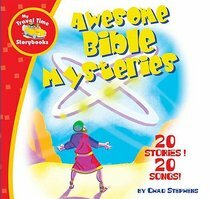 Bible stories, facts and sing-along songs! Ages 3-7.